SC Works Greater Upstate provides job seekers a central location to receive a wide array of employment services. The mission of the Centers is to assist you in the attainment of meaningful employment consistent with your interests and abilities. We want to help connect you to employers in our area. Come discover what BMW, Michelin and more than 1,800 other manufacturing companies already know. Upstate South Carolina exhibits what a competitive advantage looks like. The Upstate is the ideal place to live and work! Construction is on the rise. Our community is experiencing lots of growth. Growth produces jobs! Major construction contractors such as M.B. Kahn and Harper Construction Corporation are seeking skilled and unskilled workers to meet the demand of the current projects. If you don't have a skill, that's ok. We have opportunities for you to learn on the job (and earn a wage). Click on the links below for information on a few projects currently underway. Remember, this list is not all-inclusive. There is much more happening here! The Upstate, located at the foot of the Blue Ridge Mountains, is known for its scenic vistas and its welcoming communities which are rich with international diversity and cosmopolitan amenities. Our region has something for everyone: an active nightlife, a wide range of cultural activities from Broadway musicals to college football, and scenic lakes and mountains for recreational activities. It is endowed with excellent health care and quality schools, all within a region where the cost of living is 10% lower than the national average. 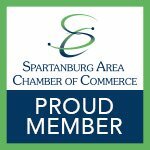 Spartanburg County is unmatched statewide in economic development and job creation, with 2,163 new jobs created in 2015. There are more than 19,000 jobs within a 1.5 mile radius of Downtown Spartanburg. Spartanburg County is so great?